Debenhams' chairman has said the firm was forced to rush out an early trading statement on Monday to stop "nosy neighbours" gossiping about its future. Sir Ian Cheshire said speculation about the department store chain had become "a circus" and it wanted investors to know that trading had not collapsed. "We're not insolvent," he told BBC Radio 4's Today Programme. But he said the retailer was looking at "every option in the longer term" to turn around its performance. "The only analogy I can have to it is like having a bunch of nosy neighbours watching your house. "Somebody sees somebody in a suit going into a room. The second person concludes it's a doctor, the third person concludes it's an undertaker and by the time it gets to the end of the day you've got cause of death and everyone's looking forward to the funeral," he said. Debenhams' shares plunged 17% on Monday, eventually closing 10% lower, after the company confirmed at the weekend that it had appointed consultancy firm KPMG to help improve its fortunes. In its trading statement, the retailer said that annual profits would be below June's downgraded forecast, but in line with current market forecasts. Sir Ian said that speculation it was actively driving an insolvency process aimed at reducing store rents with landlords and cutting stores, known as a company voluntary arrangement (CVA), was "simply not true". "If that's the right thing for the company and our broader stakeholders then obviously that's an option but the implication was we were about to do it and that... trading had somehow collapsed," he added. He noted when he joined the board two years ago, it had successfully followed that process in Ireland and had "made a loss-making business into a profitable one and saved thousands of jobs". Sir Ian also confirmed the company planned to close stores and said it was "working out way through what was an appropriate mix". He said the main issue for these plans was the "flexibility of store leases". Since then two of those stores have closed - Farnborough and Eltham in south-east London - with eight remaining stores still under review. Sir Ian Cheshire's job this morning was to reassure the market - and Debenhams' customers - that the department store chain was not going to be the latest casualty of the retail wars. He did that, up to a point. The retailer was not, he said, actively considering a company voluntary arrangement, the controversial restructuring process that allows companies to slough off legacy costs and emerge fitter and leaner. He did not rule it out, however, and hinted that much depended on negotiations with landlords. If they were not more "flexible" - code for agreeing to reductions in rents, or breaks to leases where stores are losing money - then all options were still on the table. Investors would have hoped that Sir Ian's comments would have helped shore up the share price, down by more than 90% since the company floated on the stock market in 2006. It listed then at 195p, and the stock sunk to close at 11.5p yesterday. In early trading they crept forward to a smidgen under 12p. The rot has been stopped for the moment, but the market's clear verdict is that there is a risk that Debenhams's shares might in the end turn out to be worthless. It is a race against time. If Sir Ian and his board can shrink the estate, renegotiate leases and sell assets faster than trading declines, then they might prove the doubters wrong. 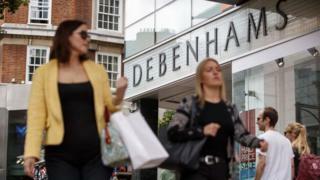 As part of its cost cutting plans, Debenhams said in August that 80 to 90 jobs at its headquarters would be shed. That followed an announcement in February that it was planning to cut 320 store management jobs. Many of Debenhams' rivals are also struggling, with House of Fraser entering administration and Marks and Spencer saying it intends to close 100 shops. Sir Ian said the entire retail sector faced a "structural shift" as more shoppers went online, but he denied the department store format was "dead". People still enjoyed the social aspect of shopping, he said, adding that there was scope for what he called "a 21st century department store" based on a mix of online and offline shopping.